My, my this world can look dreary once the trees show their branches and the grass turns as gray as the sky. When the sun is obscured by the clouds, our blue clear lake reflects nothing but gray right back at us. 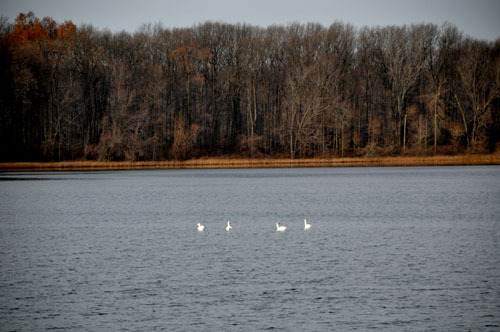 But just when all is gloomy and dreary, these swans fly in. Last year there were two; this year there are four swans. Their arrival puts them just in time for Christmas, and in the way that we deck the dreary world with holly and evergreens, the swans deck the lake in pure, pristine white. You can get an idea of the size of these swans are by looking at the size of the geese. The geese are obviously trying trying to rub elbows with the swans, just hoping some of the swan’s beauty will rub off on them. Yet, they don’t hold a candle to the grace, majesty and beauty of these swans. This is my best and hardest shot of the weekend– because it was difficult to keep my eye on the lake, and when the moment finally did arrive, I had to drop the rake to grab the camera at just the right moment when the swans were flying. They flew in a big circle, heading off towards the woods, and then arcing around towards the house. The swans are a nice reminder; like the dreary world outside, these swans were once ugly ducklings. beautiful! what a treat to see. How beautiful! Thanks so much for sharing. Hi Susie, I love your stories, I can hear you talking while I read them. The lake looks soooo beautiful, oh how we are looking forward to living there, 3 and 1/2 years and counting. My Dad’s favorite book was “Like Water for Chocolate” , I need to read it. Also, I love to scrapbook, so hold on to your Mom’s keepsakes and I will do it for you next summer. I always need a good project and I would really like to do that with you. My heartfelt sympathy for your friend and her family. That darn breath cancer, I am sorry for your loss. 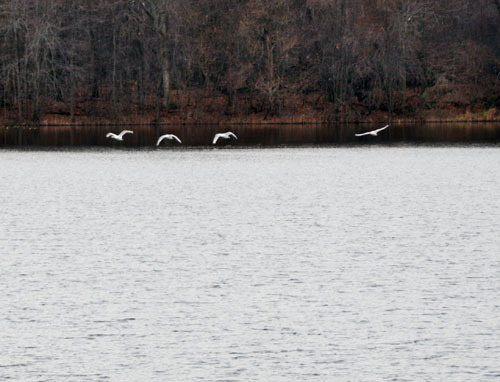 ahhh beautiful – I don’t think I’ve ever seen a swan fly – thanks for capturing the image! We were in Brooklyn a few weeks ago and saw more swans than I’ve ever seen in one place at one time. Must have been 50+ begging for food. So beautiful and graceful. Magical creatures. Beautiful, they really are! 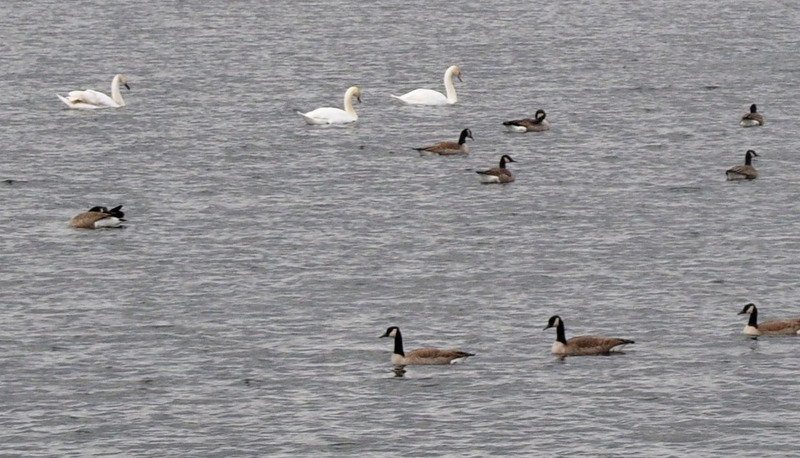 I am amazed at how big they are compared to geese and that you got the shot of them in flight!. Great capture. Oh Susie. How lovely. Your lake always seems kind of magical to me and it certainly looks it in these photos.